All the places he's been since we've been in control of his good self, at any rate. 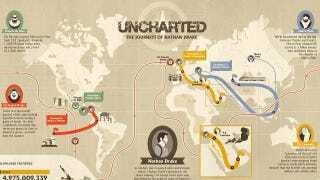 Posted by Sony yesterday, the map contains some standard infographic stuff, but also a handy guide to just where Drake's travels have taken him across four games. It's...not that far, really! You should come to Australia next time, Nathan. The beaches are lovely, the people are friendly, and nobody looks twice at a man with such sloppy shirt-tucking standards.